A Hearty "Thank You" to all of our Stewardship Volunteers! Below are some of the Lake Oswego Stewardship Volunteer's accomplishments. 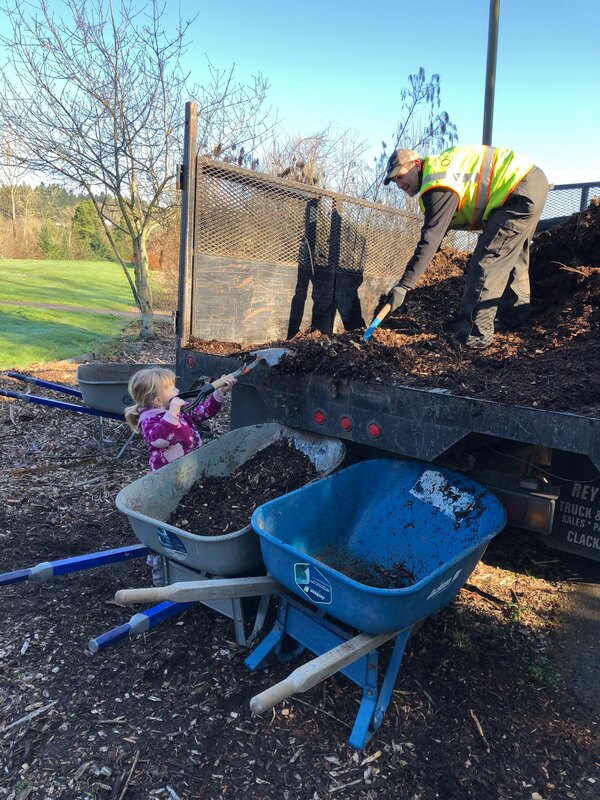 If you would like to become a Stewardship Volunteer or get involved at your local park, check out www.lo-stewardship.org for current work parties and information, or email Babs Hamachek, Lake Oswego Stewardship Coordinator: bhamachek@ci.oswego.or.us, or by phone: 503-534-5697. Thank you for your hard work, volunteers! 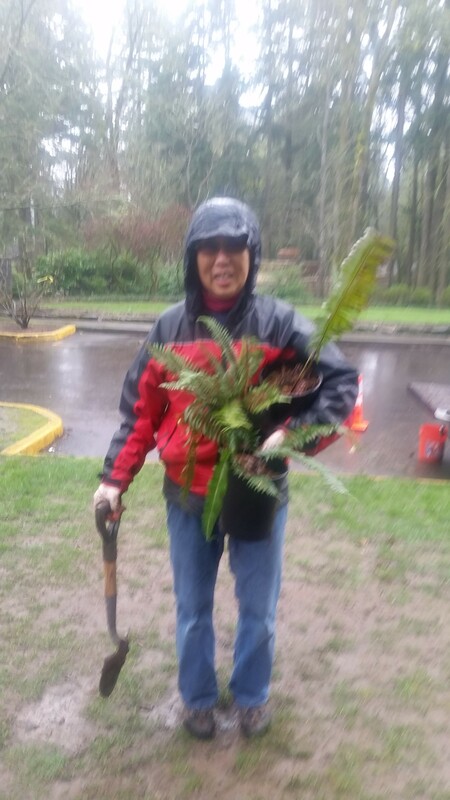 Sunday, April 15 - Over 30 volunteers made an appearance at this rainy planting party! Sword ferns and other native shrubs were planted to celebrate Joan Quinton-Cox, a long-time volunteer and natural spaces advocate. 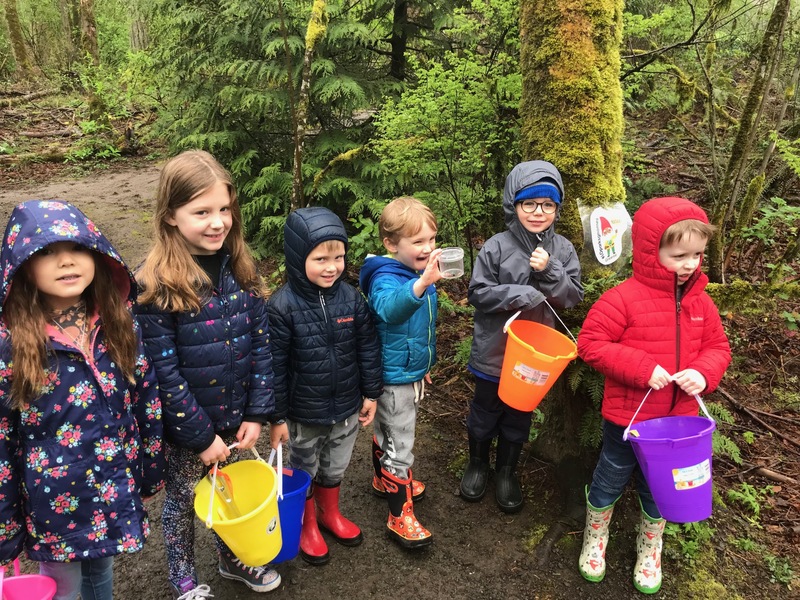 Friday, April 6 & Friday, April 13 - Dozens of preschoolers flocked to Springbrook Park to enjoy learning about trees and how they are a part of nature. 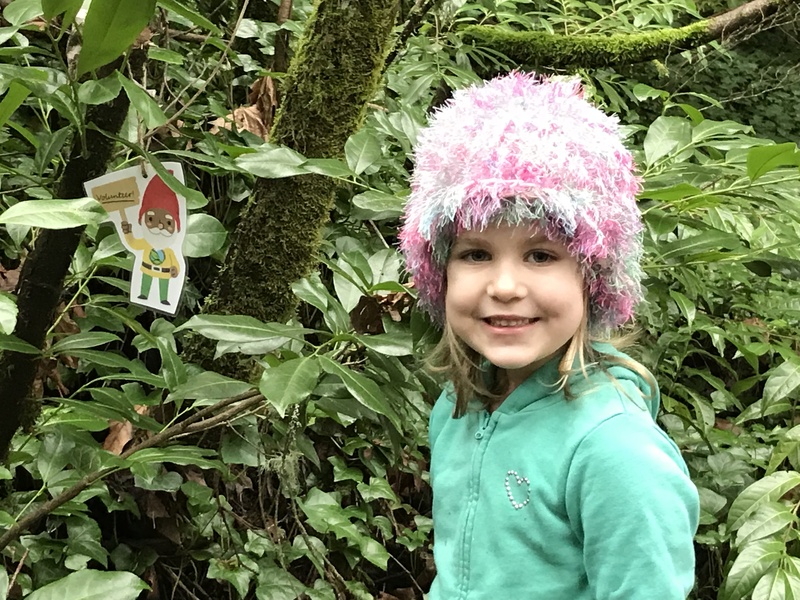 They found bugs, slugs, leaves, and a gnome or two hiding in the woods on their adventure. The Friends of Springbrook Park helped lead these fun and instructional outings designed to inspire a passion for Stewardship in young leaders. Sunday, April 8 - Fifteen volunteers did the first ever Stewardship planting party where trillium were nestled into the recently cleared landscape. 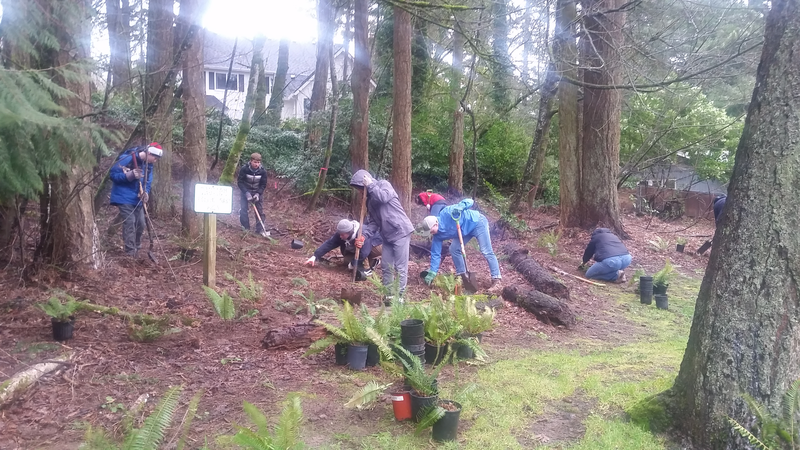 The focus was on species native to Oregon -- in all, volunteers planted 50 Trillium ovatum, 50 Tellima grandiflora, 25 Iris tenax, and 25 Achillea millefolium, adding some color and bloom to the Woodmont landscape. Congratulations, Friends of Woodmont! 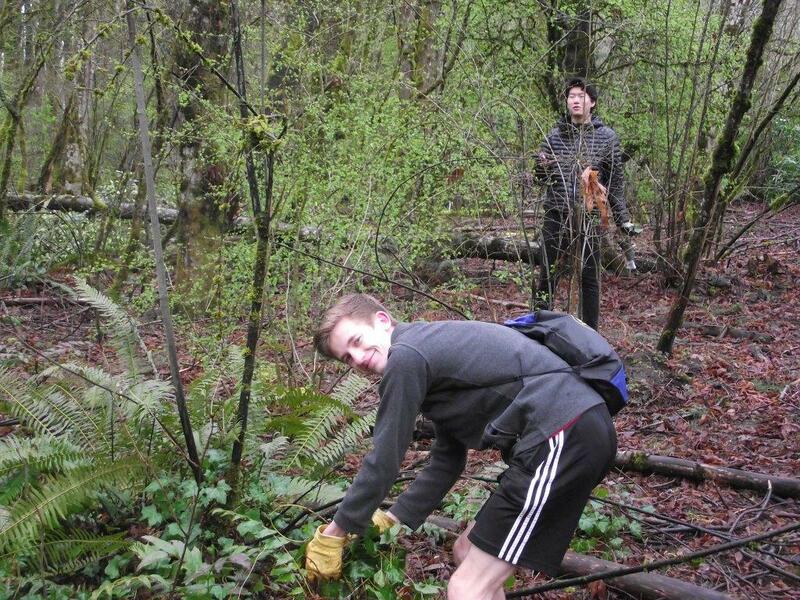 Friday, March 23 - A community-minded group of high schoolers from Lake Oswego High School, under the leadership of Ryan Lew, headed into Springbrook Park to pull invasives and spread their love for the community. They spent two hours removing English ivy and Herb Robert by hand. Thank you, volunteers! Tuesday, March 20 - The group Mothers of Preschoolers turned up on a beautiful day to help mulch the native plant landscape in Foothills Park. Jeff Williamson and Megan Big John helped to instill a love of nature and preservation in these wonderful preschoolers, supported by their awesome mothers. Thank you, MOPS! 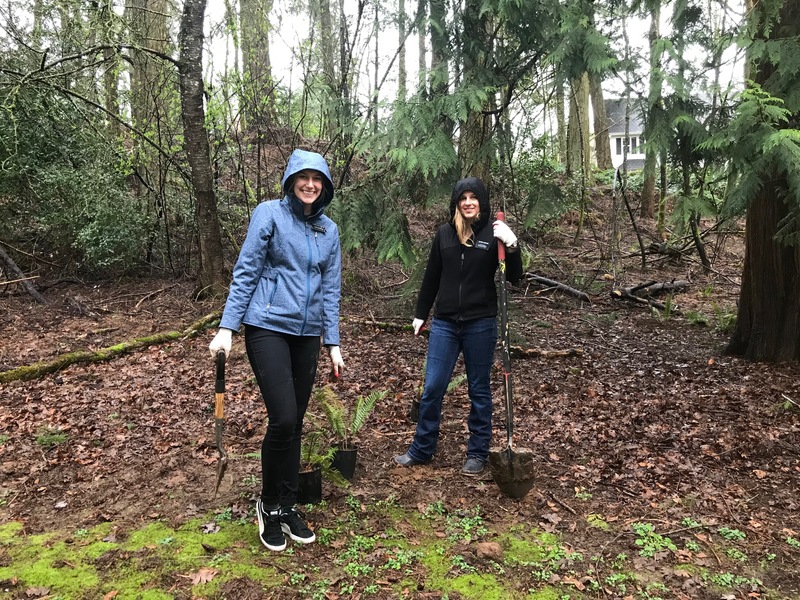 Sunday, March 18 - Thirty six volunteers came from all over Lake Oswego, Portland, and other surrounding cities to help Friends of Iron Mountain remove invasives and plant 100 sword ferns. Riverdale honor students came in droves to represent their school and work beside friends and neighbors. An incredible showing for an incredible natural area! Saturday, March 10 - A fabulous group of volunteers showed up for the Southwood planting party. Kim Valley requested a diverse group of native plants to nestle into the carefully cleared landscape in Southwood park. Years of dedicated work by volunteers has allowed for the incredible progress in this park, and we're grateful to everyone who showed up to plant! 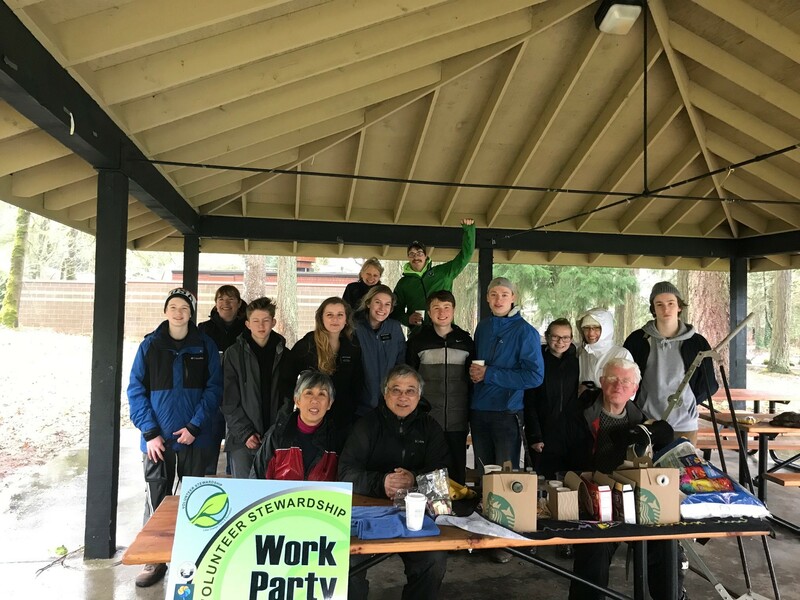 Saturday, March 3 - Friends of Waluga Park celebrate another successful work party, with 16 volunteers from all walks of life including LDS volunteers, volunteers from SOLVE and NYML, and wonderful neighbors looking to get involved in their community! Together, they planted 200 more sword ferns in East Waluga park, drastically changing the natural areas! Keep it up, Friends of East Waluga! Saturday, February 24 - Friends of Springbrook Park had an incredible turnout of 49 volunteers at their planting work party! 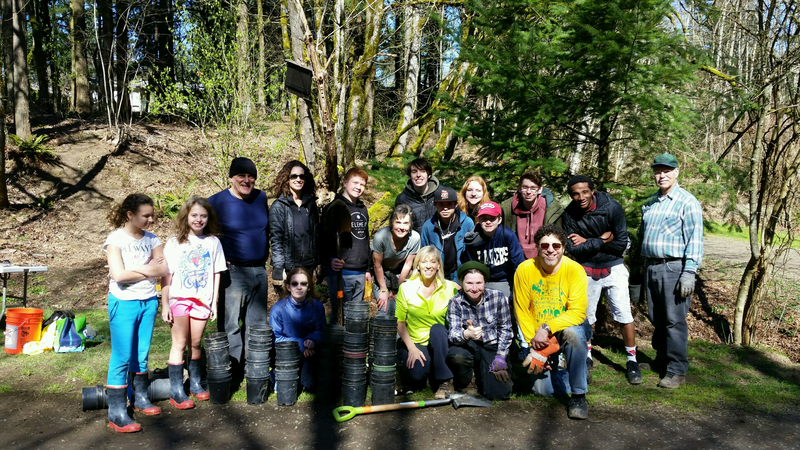 Lake Grove Presbyterian Church's youth group, students from Riverdale High School's National Honor Society, as well as volunteers from SOLVE, and as far away as Tualatin, Oregon City, Northeast Portland, and Beaverton! The volunteers planting 250 sword ferns with ease, and moved on to removing ivy and spreading gravel on a trail. Congratuations to the Friends of Springbrook Park! Saturday, February 17 - Thirteen incredible volunteers braved the freezing wind and rain to plant 200 native sword ferns in East Waluga Park! 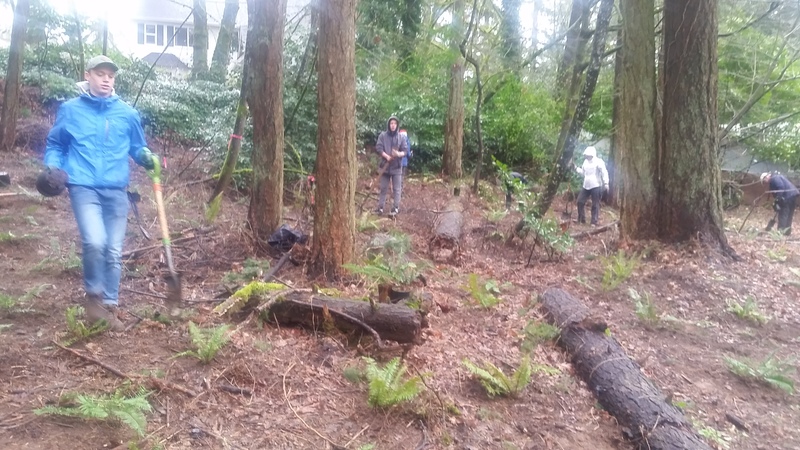 Previous Friends of Waluga Park work parties had diligently worked to clear ivy and other invasive species from this natural area, leaving a nice, clear swath for our new sword ferns to be nestled into their new home. Congratulations to the Friends of Waluga Park on their successful first planting party! Saturday, February 10 - This important work party continued the ongoing efforts by Friends of Southwood Park to clear the natural areas of invasive species. The work of these volunteers is critically important, because this freshly cleared area will be planted with native species at their next work party. Thank you so much to the nine volunteers who put in the time and effort necessary to foster this healthy and beautiful natural area. 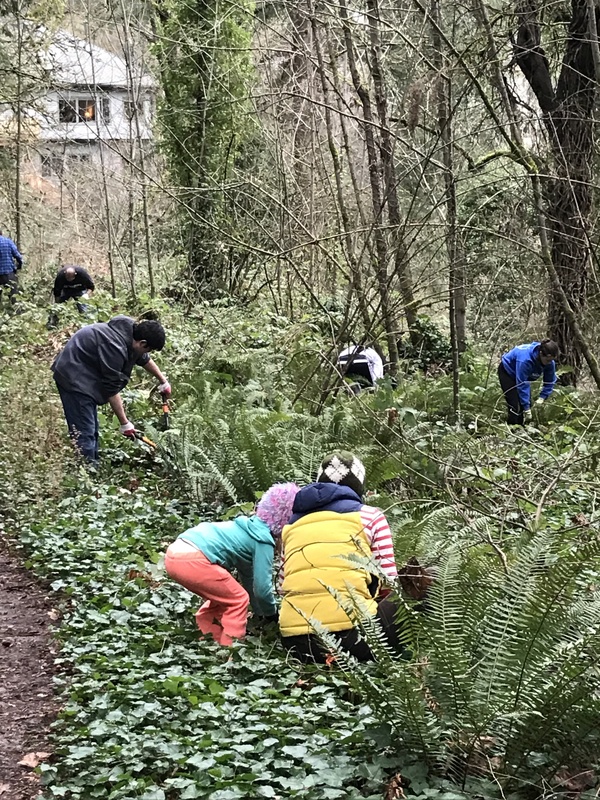 Sunday, February 4 - Lily Bay Natural Area hosted 22 volunteers at a Stewardship work party to Free the Ferns from invasive species, as well as remove ivy from trees and removing blackberries. Volunteers came from Hillsboro, Oregon City, West Linn, Portland and Lake Oswego to lend a hand to Mother Nature. There were students from 4 high schools representing NLYM (National League of Young Men), a PSU college student, a boy scout, students from Hillsboro, adults from NE Portland, and local residents. The 3 Stewardship Gnomes hid in native species providing a learning experience as our youngest volunteers searched for them. Saturday, December 9 - The Friends of Southwood Park were joined by an enthusiastic group of about two dozen volunteers. They planted 200 ferns in record time with the help of Park employee Kyle Bateman. 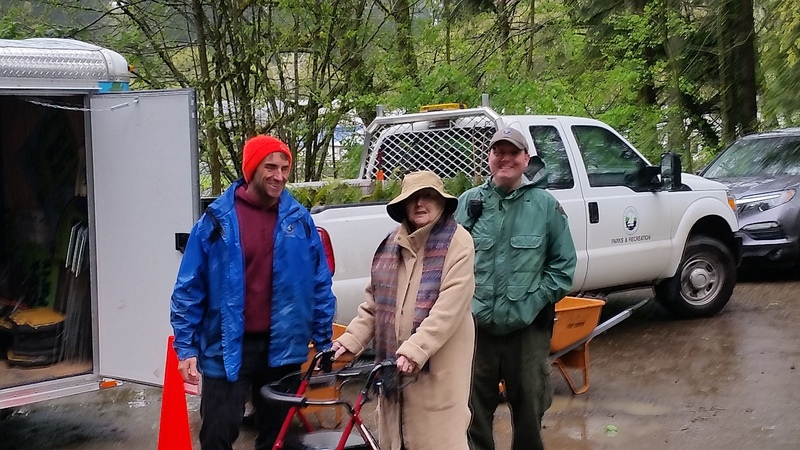 Kyle brought the Stewardship trailer and truck to the work party, and people from Lake Oswego and the Portland metro area helped to conserve this important Lake Oswego jewel and restored the natural habitat. They planted in an area that was previously cleared of invasives through the hard work of the Friends of Southwood Park volunteers. Sunday, December 3 - There was a sun break long enough to take advantage of all of the wonderful volunteers that showed up to the Freepons Park planting party! These Stewards were able to plant 200 sword ferns in record time and stayed to help our Friends Group leaders clean up. Great work, volunteers! Rip Out the Invasives at Iron Mountain Park! Sunday, November 12 - Fifteen dedicated volunteers showed up to help the Friends of Iron Mountain pull out invasive species in the woods of Iron Mountain Park. Together, they made a huge impact on the landscape and the environment! Saturday, November 11 - Southwood Park had an exciting work party with eight volunteers, who unearthed a discarded shopping cart from the weeds and cleared the natural area of the park by the stream of invasive species! Sunday, November 5 - A big thanks to Cub Scout Pack 413, who showed up for their community in a big way during the Hallinan Heights Woods planting party! 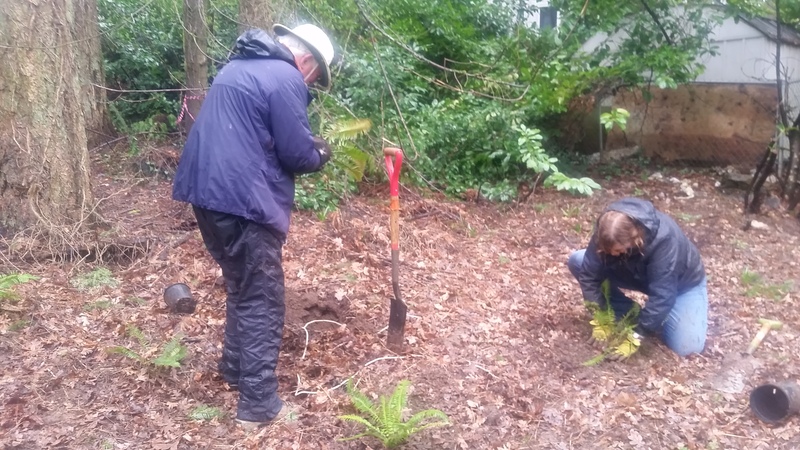 They, alongside other community volunteers, planted 200 native ferns that will help restore Hallinan Heights Woods' natural environmental balance. Saturday, November 4 - During the second phase of the creek-side cleaning campaign, Friends of Woodmont Park were able to clear away the grasses and other non-native plants that were crowding natives on the West side of the creek! Congrats to the volunteers for making such a huge impact! Sunday, October 29 - The first phase of these two-week consecutive work parties focused on ripping out gigantic blackberry bushes and clearing invasive grasses along the East side of the creek that runs through this natural area. The volunteers got elbow-deep in the weeds, using pickaxes and shovels to pull up gigantic blackberry root balls! Wow! Saturday, October 28 - The Friends of Waluga Park were lucky in having a gorgeous fall day to spread gravel and make huge improvements to the trail between East and West Waluga parks! About 20 volunteers had a hand in hauling and spreading gravel, and the results were amazing! Saturday, October 21 - The Friends of Trees group held a massive work party down at River Run Park, where they planted a variety of native species to restore the habitat and had fun while they were at it! Wednesday, October 18 - Our hard-working Friends Group Leads joined members of the Park Board and members of the Parks & Rec Staff to address successes and issues faced in the parks. There was excellent discussion of challenges faced in each park, as well as lots of inspiration from successful volunteer work parties! During our meeting, we gave a big thank you and an invasive bouquet send-off to Jim and Barbara Fisher, who have dedicated 15 years to helping in Hallinan Heights Woods. Thank you for your service and leadership, Barbara and Jim! Sunday, October 15 - Friends of Iron Mountain Park had massive success in clearing away invasive species and freeing up space for natural species with the help of 11 volunteers. These dedicated and spirit-filled neighbors and community members made a huge impact with their shovels. Thank you, volunteers! Saturday, October 14 - The Friends of Springbrook Park threw a big work party with a whopping 21 volunteers! Thanks to community members as well as partnerships with SOLVE and Just Serve, we had many people from all walks of life including students from PSU and Chemeketa Community College and LDS youth helping plant native species. We are so grateful, because they got a tremendous amount of work done in the park! Over 350 native plants and ferns were planted along the White Oak trail on the south side of Springbrook. Incredible! Farm Life is the Life For Me! Saturday, October 14 - Seven dedicated stewards showed up to the Brock Property near Luscher Farm to clear invasive species and spread mulch to protect the native plants. They achieved everything they set out to do in only three hours! Congratulations, Friends of Luscher Farm! Sunday, October 8 - Volunteer Mike Buck joined Friends Group Leaders Jim and Barbara Fisher and others to clear English Ivy away from native plants and trees as well as pick up trash along the roadway and in the natural area. When the ivy was cleared away from three huge pines, barbed wire from decades ago was found poking right through the middle of these gigantic trees, as the trees had simply grown right around it! Nature is unstoppable, and so are our volunteers! 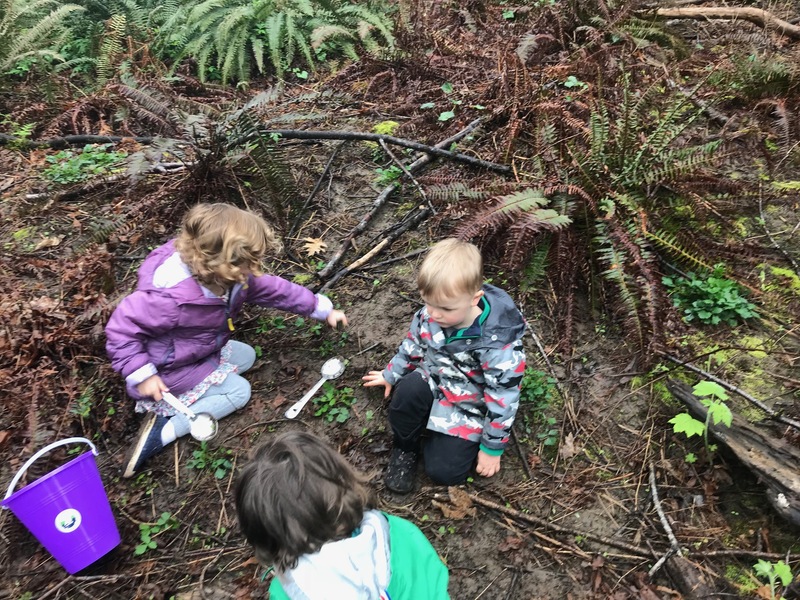 Preschool Nature Walks - A Wild Success! Friday, September 29 and Friday, October 6 - After hours of coordination and hard work by Friends of Springbrook Park under the leadership of Anne Lider, 87 preschool-aged children and 42 accompanying adults frolicked in the woods of Springbrook Park over the course of two Preschool Nature Walk events. During each nature walk, the kids split into small groups behind the adult leaders and marched into the woods to engage with nature. The first walk, held September 29, focused on playing a game similar to “I Spy,” in which the children focused on opposites: Big versus little, rough versus smooth, and leaves that lived for one year versus leaves that live for a long time (deciduous versus coniferous tree leaves and needles). The second walk, held on October 6, involved finding things whose colors matched: leaves, insects, and a variety of other natural items. Every walk included lots of time to dig and explore, and hopefully instill a fascination for nature in young minds. Besides educating these preschoolers, the intent behind the Nature Walks is to foster the next generation of our parks’ Stewards! Path TLC in Freepons Park! Sunday, September 24 - Eight wonderful volunteers came to the Friends of Freepons Park work party to help distribute gravel evenly over the Freepons Park pathways. Now these beautiful trails are ready to be enjoyed all fall and winter! Thank you, volunteers, for your heavy lifting! Rock (or gravel) on! Tuesday, September 19 - The wonderful Mothers of Preschoolers (MOPS) group braved the rain and came down to Foothills Park to do some heavy lifting spreading joy and bark dust with their little ones! Tuesday, September 12 - PGE and Lake Oswego partnered up to do excellent work down at Foothills Park. The awesome team of volunteers from PGE dug up weeds and spread mulch in the flower beds -- look how full that truck bed is! Go team! Sunday, September 17 - Gwen and Larry Bruss tally passersby on the Willamette Greenway Trail at George Roger's Park. Each year, Lake Oswego partners with Metro to do the trail count, which helps Metro allocate funding to build new trails and do trail repairs. This year, we had seven volunteers at three locations over two days! Good work, everyone! ARF ARF -- That Means "Thank You" in Doggy Language! 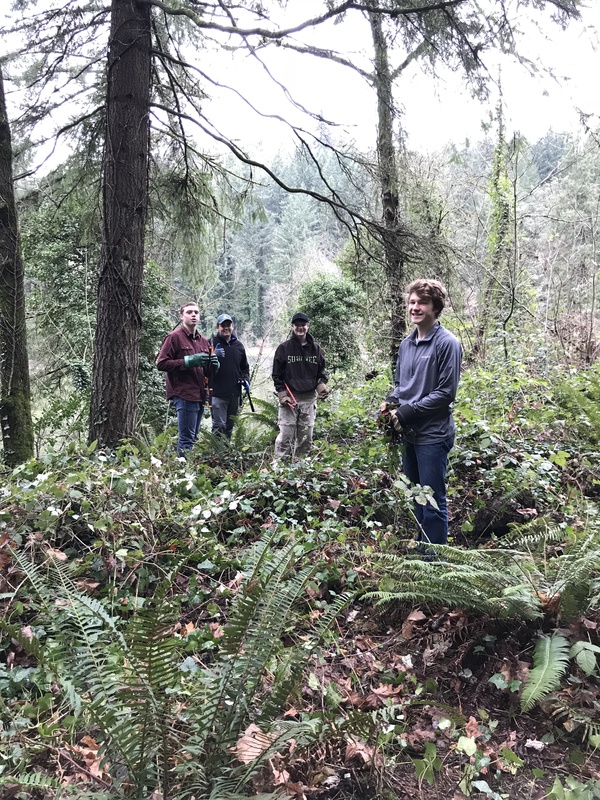 This fall, 16 dedicated volunteers helped us survey four off-leash areas in Lake Oswego's parks to garner valuable information on what the public thinks about the trial off-leash areas! Above is Karen Reid, who helped at Pilkington Park! Thank you, volunteers! Thank you for visiting the Stewardship Stand at the Lake Oswego Farmer's Market -- we loved seeing you! Saturday, September 2 - Ranger Ben and dedicated Southwood Park Friends Group leader recruit new volunteers and show off our gnomes at the Lake Oswego Farmer's Market! Wednesday, August 16 - Two courageous boy scouts worked hard removing invasive blackberry vines and picking up trash at Southwood Park! Thank you, Scouts! Thanks for Visiting the Stewardship Booth at the Westlake Concert Series! Wednesday, August 16 - It's always exciting when young people get involved with Stewardship! Thanks for visiting our booth at the 2017 Summer Concert Series in Westlake Park! Friends of the Parks & Volunteer Appreciation BBQ & Pie-A-Palooza! Wednesday, July 19 - The Parks Department had a great time Grillin' & Chillin' a fantastic Bar-B-Que picnic for our valued volunteers that help in the Parks' Natural Areas! Volunteers brought friends, family, and their appetites to the Third Annual Stewardship Volunteer Appreciation BBQ! There was great food, incredible homemade pies & plenty of cold drinks in our wheelbarrows...you can't beat that for Stewardship ingenuity! We celebrated our volunteers through Stewardship recognitions, service awards, raffle prizes and by revealing the names of our three Stewardship Gnomes: Greenie, Blossom, and Oak! We greatly appreciate your time, energy, and commitment to protecting and restoring Lake Oswego's beautiful park natural areas. Looking to participate? Go to www.lo-stewardship.org to take part in a Stewardship Work Party!